Reuben has been eyeing up my rucksack by the door, possibly noticing that his gear is not sitting next to it. 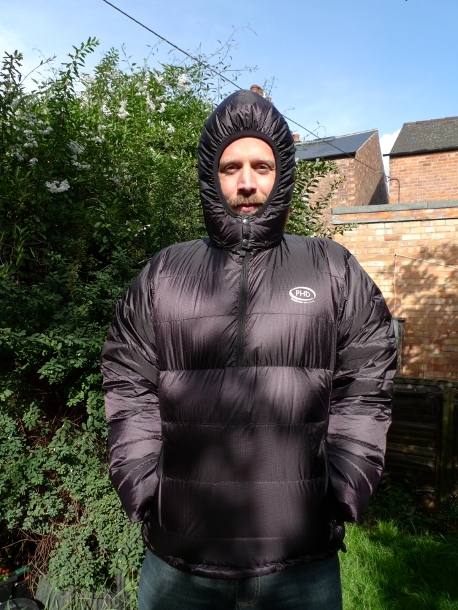 I’m off first thing in the morning minus Reuben for a backpacking jaunt in the Yorkshire Dales to meet some other outdoor types. There has been talk of camping on summits to eat dinner whilst the sun sets. Looking at the weather forecast that may well be a little bit optimistic as the forecast is for gusts of wind to reach 80mph on the Yorkshire hill tops. It’s also looking decidedly chilly after the recent mild autumn. That’s why I’m going in fancy dress. Just a quick rant and then I am going to bed. I recently did a post about a walk across the Flow Country to Loch Strathy bothy, one of the highlights of my trip to the far north. You can read that post here if you missed it. ‘Energy minister Fergus Ewing approved the application from SSE Renewables, despite overwhelming opposition to the plan. Of the 174 representations received from members of the public, 166 were against the project and just eight were in support’. So who are politicians there to represent? Is there any point in making your voice heard? Petitions are probably a complete waste of time, however they only take a few seconds to complete. Another one for you here. When I started this blog at the beginning of 2009 my aim was to build up a series of trip reports, an online diary that I can look back on in old age. I also wanted it to be a resource for others when planning their own adventures in the great outdoors. Hopefully I have managed to stick to this aim with the odd foray into gear or an occasional whinge. All my trip reports were simply listed in date order which I did not feel was very satisfactory. I have therefore rearranged them into areas, hopefully making the page easier to use. 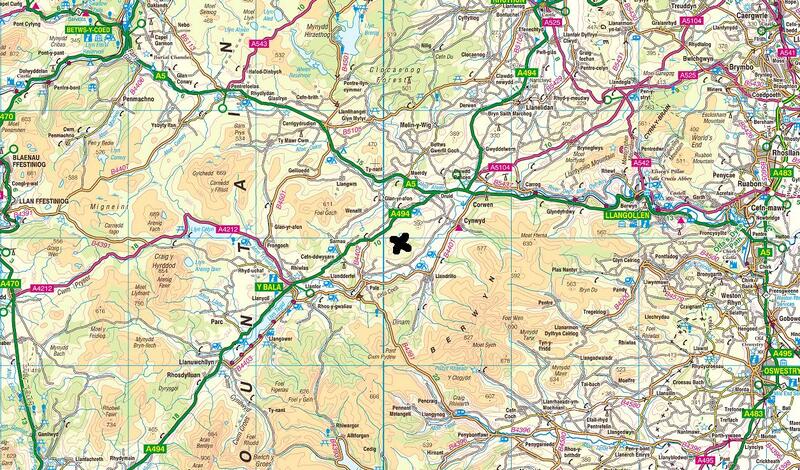 It has served to show that I have neglected some areas such as the Lake District! There are 34 backpacking trip reports listed there now, ranging from two days to two weeks. They can be accessed via the ‘Trip reports – backpacking‘ tab above. I hope to do the same with the day walk page at some point. If I have broken something please let me know! I have to admit that until earlier this week I had absolutely no idea where Mynydd Mynyllod was. However as a backpacker who often goes to Snowdonia it is an area I have passed many times without realising. I would also assume that most people reading this have probably passed it on the way to the mountains. The river Dee flows through a lovely valley and I always enjoy the drive west from Llangollen before continuing into south Snowdonia via the A494 to Bala, or occasionally on the B road via Llandrillo. I much prefer exploring the south of the national park with its isolated mountain ranges or the empty Berwyns to the east. A quiet unspoilt corner of Wales. There are proposals to plonk 25 turbines which are 145 metres high on a wedge of moorland called Mynydd Mynyllod. 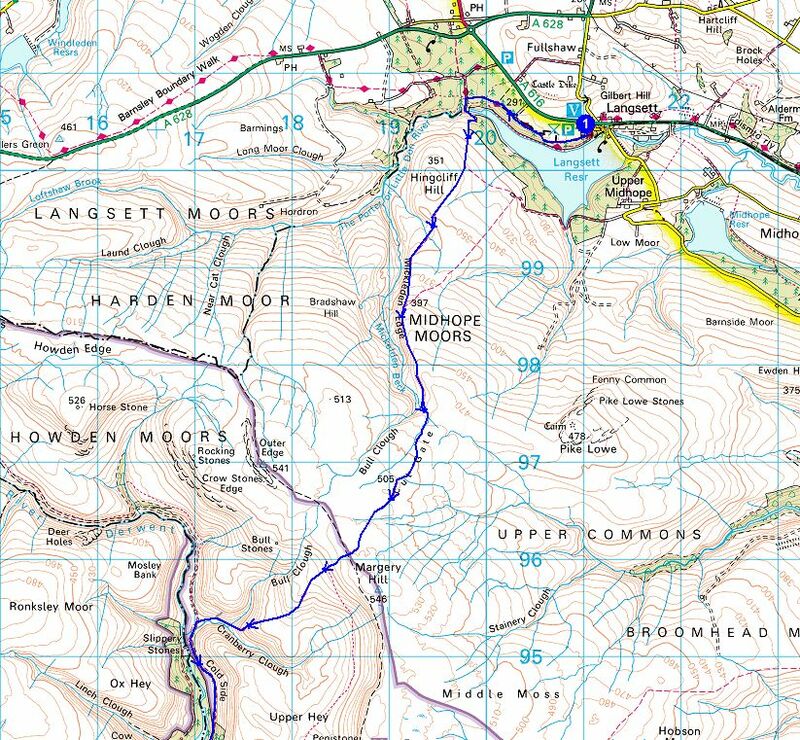 Unfortunately developers are unable to simply ‘plonk’ turbines as first they need to rip up miles of moorland for access tracks and fill the hills with toxic concrete. I could not find a decent map of the proposed site, so I have mocked up my own. I have crudely marked the area proposed for development with an X. Although not actually located within the National Park, it is pretty damned close and the turbines would be visible and intrusive from a huge area. Rather than re-write what has already been written there is a website called Stop The Exploitation of Mynydd Mynyllod, please have a look for more information and how to object. Last nights Question time was filmed in Aberystwyth and there was a question about windfarms. You can view the programme by clicking here. The question is around the 42 minute 40 second mark. According to the BBC website it should be available until 16th November 2012. Warning: This blog post may contain mist. It seems to be common these days for the weather forecasters to get it completely wrong. The forecast for Sunday was for early morning mist and drizzle to disappear by midday and for the sun to come out. There was even a hint in the mountain forecast that an inversion could well be on the cards. Well it was very misty when I arrived at the car park at Langsett Barn, a dark dank mizzle causing the trees to drip loudly onto the roof of the car. 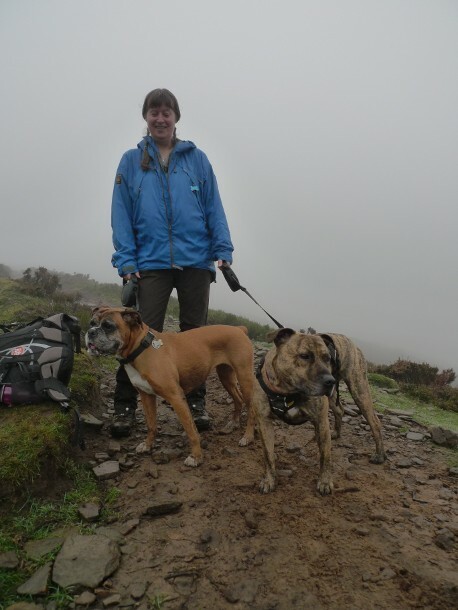 I had arranged to meet Chrissie for the day, a fellow dog-owning outdoor blogger, her site being Dixie – Walking the Pennine Way and other adventures. 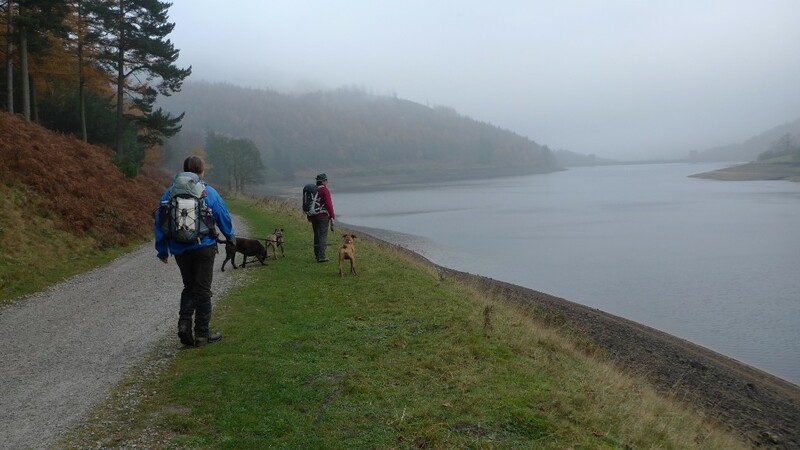 Chrissie was dropped off by her Husband Geoff and would be picked up later in the day at Fairholmes, on the other side of the moors in the Upper Derwent Valley. 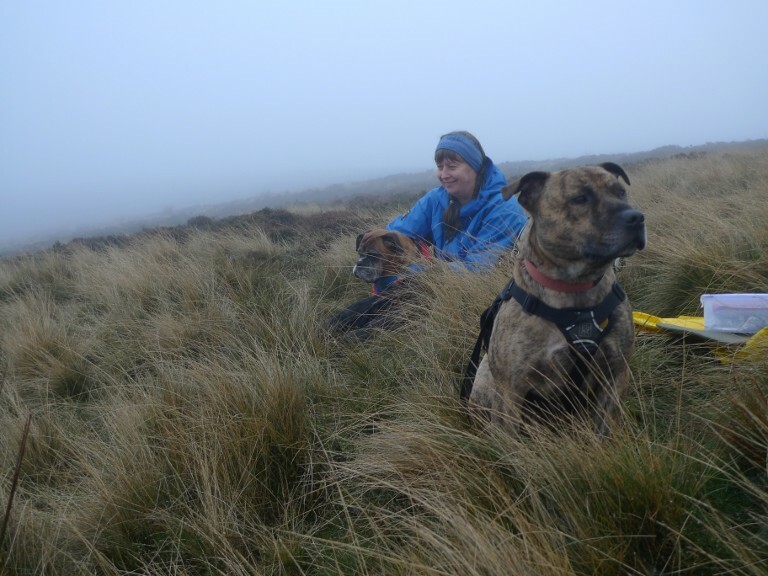 The plan was to walk with her to the summit of Cut Gate before disappearing off across the Derwent Watershed to visit Outer Edge and the Horse Stone. We were soon both being towed along the track on the north shore of Langsett Reservoir by two enthusiastic hounds. Chrissie had warned me that her dog Dixie who is a ten year old boxer, is a bit of a grumpy matriarch. However after a few minutes of Dixie informing Reuben that she was boss, an equilibrium was reached and they got along fine for the rest of the day. 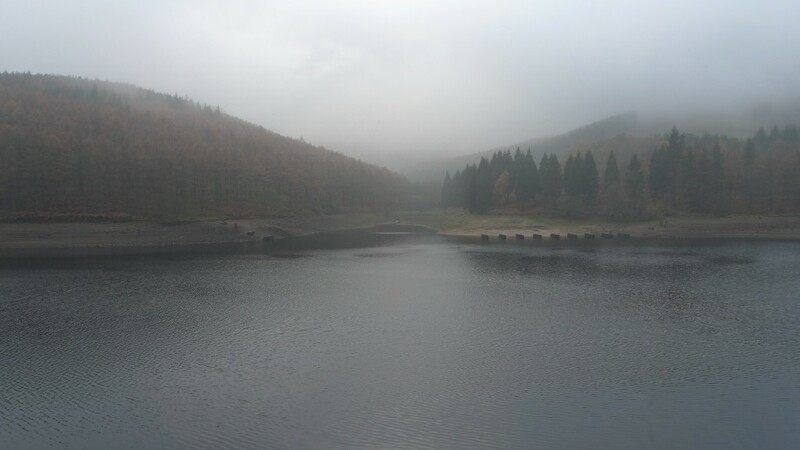 We did not even glimpse the reservoir as we walked alongside it, the mist was so thick. We were soon climbing up the bridleway and onto the moors, chat coming easy about common interests. With no views I grabbed an opportunity to snap the two canine friends. The higher the bridleway climbed the wetter and boggier it came, the firm surface soon disappearing in a morass of liquid peat. I soon regretted wearing my inov-8’s and no gaiters, as in no time I was covered in the black stuff from the knees down. However it was good to have a spring in my step that boots don’t allow and although wet my feet remained warm. With height the mist turned to a fine drizzle, further reducing the prospect of climbing out of the cloud. 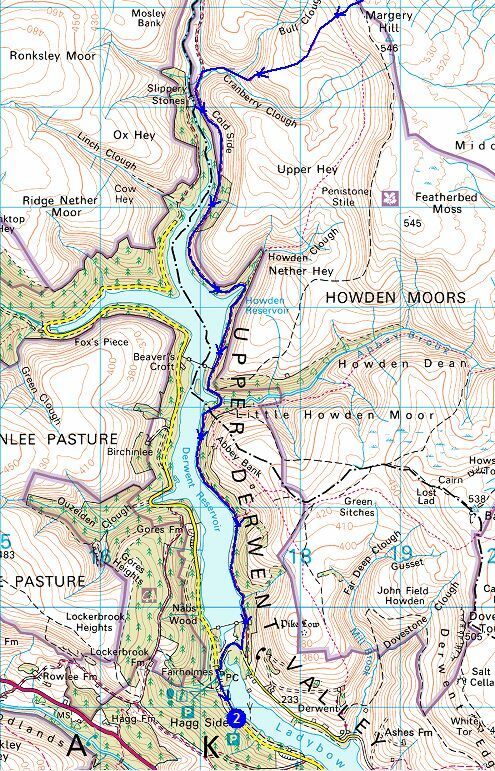 At the top of the bridleway I noticed the cairn that indicated my route north and into the pathless hinterland of the Derwent watershed. The idea of walking solo into the murk suddenly lost its appeal. Earlier Chrissie had said that Geoff had offered to drop me back at the car if I walked to Fairholmes. I decided that now was the time to take up that offer. Lunch was taken just before the descent towards the Derwent. There was a sense that we were on the edge of the plateau, a feeling of space in front of us but completely obscured by a wall of grey. It was cold, damp and windy and we did not linger for long. Down in the valley near slippery stones, a little bit of colour started to fill what had been a monochrome world up on the moors. 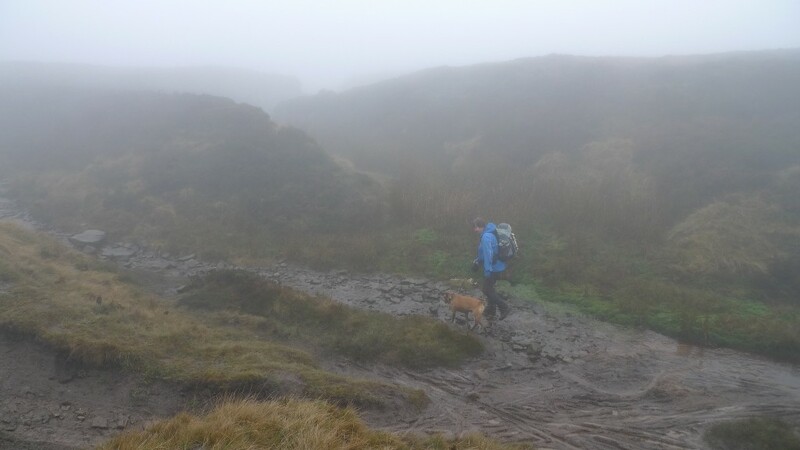 We also saw our first hiker which it turned out to be Geoff with Tilly the chocolate lab. Up until that point the only people on the moors had been peat stained mountain bikers. 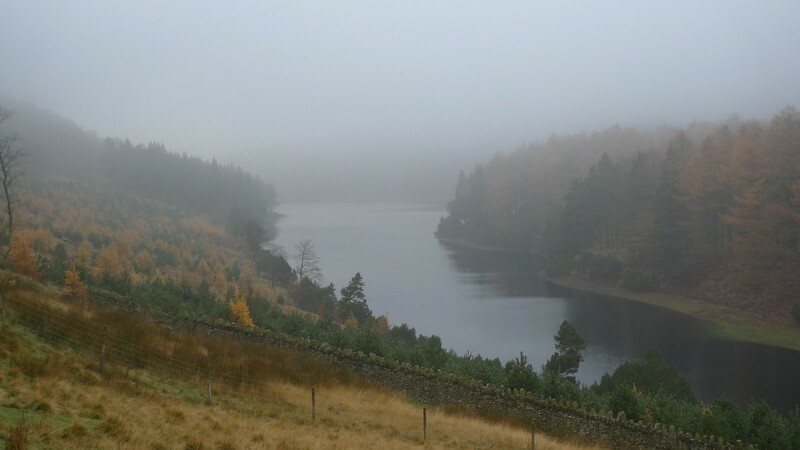 The Howden Reservoir soon came into view, the mist skimming the tops of the trees which were still flourishing a late autumn display of colour. 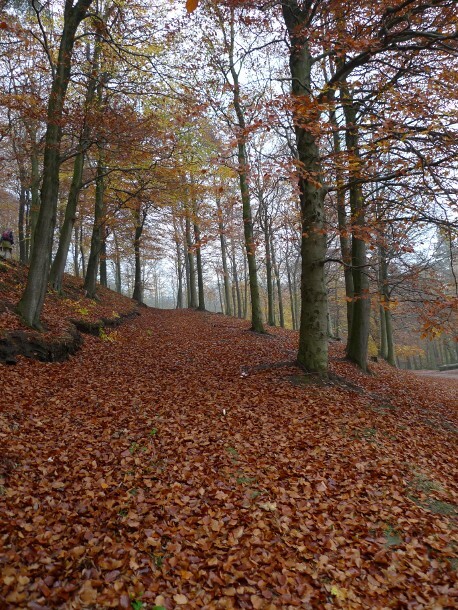 The track along the east side of the reservoirs is firm and relatively flat, giving quick and easy walking. The day trippers becoming more numerous the closer we got to the car park. Reuben and Tilly got many off lead moments and spent them bowling along at dangerous speeds threatening to send us flying on each return leg. Annoyingly there was another couple with a dog up ahead, they were walking at a much slower pace and we were quickly gaining ground. At a distance determined by Reuben to be close enough he decided to make a break for it and introduce himself to the golden lab with a flurry of kisses and a wagging tail. The response by the lab’s owner appeared to be one of panic and there was the rather pathetic image of them picking their dog up so Reuben could not say hello. I have a feeling that their dog may well develop ‘issues’. Reuben was quickly leashed so that his wagging tail could do no damage. Sadly as an owner of a Staffy it is a reaction that I will have to get used to. Every now and then there would be a hint of brightness, a fleeting patch of blue above. Overall though, the mist and murk remained. Geoff had done the sensible thing and avoided the expensive car park at Fairholmes, using the free layby just up the road. 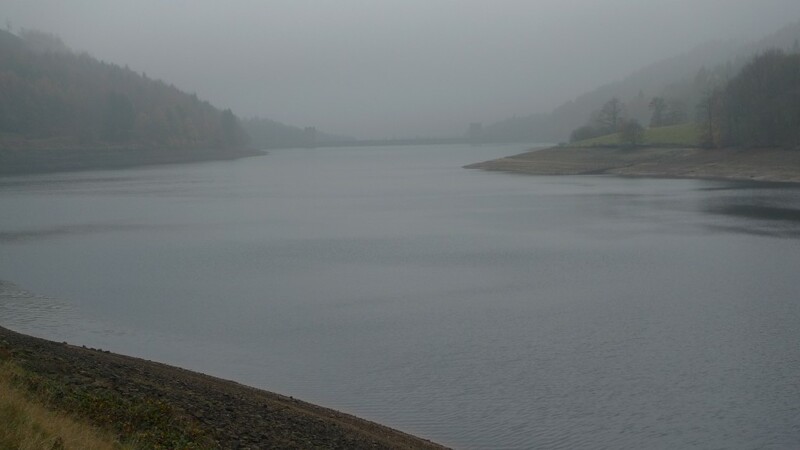 I was soon whisked back to my car at Langsett, the mist there still as thick as when we had set off. Although a view free day it was a pleasant walk with good company. It is not often that I get the opportunity to do a linear day walk, so a big thank you to Geoff for going out of his way to drop me off. I think that Reuben rather enjoyed the company of his new lady friends!